Director – James L. Conway, Screenplay – Stephen Lord, Based on the Short Story by Edgar Allan Poe, Producer – Charles E. Sellier Jr. Production Company – Schick Sunn Classics. 1839. Architect Jonathan Criswell receives a letter from his old friend Roderick Usher asking Jonathan to come and see him. Arriving along with his newlywed wife Jennifer, Jonathan finds Roderick and his sister Madeleine aged beyond their years. Roderick tells him how they have both been maddened by a crippling hyper-alertness of senses. In trying to find a way of bolstering the Usher house against frequent earth tremors, Jonathan learns of the unspeakable atrocities and devil worship practiced by Roderick’s ancestors. These have brought a curse on the House of Usher, meaning that none of the family can live beyond their 37th year. During another tremor, a falling chandelier kills Madeleine. She is placed in the family crypt. However, she has been unwittingly buried alive and emerges maddened to attack Roderick. This must not only be the worst version of the oft-filmed Edgar Allan Poe short story The Fall of the House of Usher (1839) – see below for the other versions – but possibly the worst Edgar Allan Poe adaptation ever made. The perpetrators are Schick Sunn Classics, a company that specialised in tv adaptations of classic stories – The Legend of Sleepy Hollow (1980), The Adventures of Huckleberry Finn (1981) and the notoriously bad adaptation of H.G. Wells’s The Time Machine (1978) – and sensationalistic cinematically-released documentaries on subjects that have ranged from Bigfoot in Mysterious Monsters (1976) to life after death in Beyond and Back (1978) and The Bermuda Triangle (1979), as well as Biblical works such as In Search of Noah’s Ark (1977), In Search of Historic Jesus (1980) and the tv series The Greatest Heroes of the Bible (1978). Their version of The Fall of the House of Usher had a simultaneous cinema and tv release – no attempt has been made in the cinema print to disguise the tv origin with the fade-outs for commercial breaks having been left in during dramatic climaxes. The film radiates an appalling cheapness, from the bad colour processing to the cardboard facade of the exterior of the house. Even the reading of the Poe story seems second-hand, taken more from the classic Roger Corman film adaptation The House of Usher (1960) than the actual Poe story. Like most of the film adaptations, a number of changes are made to the story. This version follows the general path of the Poe story and does retain elements from it such as having the narrator and Roderick Usher as boyhood friends. On the other hand, the narrator is now given a name and arrives at the house accompanied by his wife. The film also copies the 1960 Roger Corman version in giving us the backstory of the house where it is imbued with a physical evil due to the crimes conducted there – added to the usual moral crimes are now the standard cliches of devil worship. Edgar Allan Poe’s short story is a masterpiece of mood and desolation. This could not be a version of the story that is more lacking in mood, especially when compared to the Roger Corman and previous versions (see below). The sets look like standard period sets from a tv studio and fail entirely to ooze with gloom, despair and decrepitude. James Conway directs standard tv set-ups without any feeling for the story. The casting is downright laughable. This was Martin Landau in the days after Mission: Impossible (1966-72) and Space: 1999 (1975-7) and before he turned his career around in the 1990s and won an Oscar, where he was subsisting on an income derived from parts in B-movies and giving performances that had him in strong contention for being one of the world’s worst over-actors. Here he plays the tortured Roderick Usher with a grotesquely overwrought hamminess that is fascinating to watch. Bubble-gum vacuous Dallas (1978-91) bimbo Charlene Tilton is equally miscast as the heroine. Even funnier is the casting of the boyishly cute Robert Hays who speaks of knowing Usher twenty-five years before – something that would surely have placed him in diapers. Director James L. Conway directed and acted as producer for many of the abovementioned Schick Sunn Classics films. He also directed their handful of ventures into science-fiction – the UFO films Hangar 18 (1980) and Earthbound (1980), and one horror film The Boogens (1981). These days, Conway works in tv and has been a regular director on all the modern tv incarnations of Star Trek, among other shows, and producer of the tv series Charmed (1998-2006). 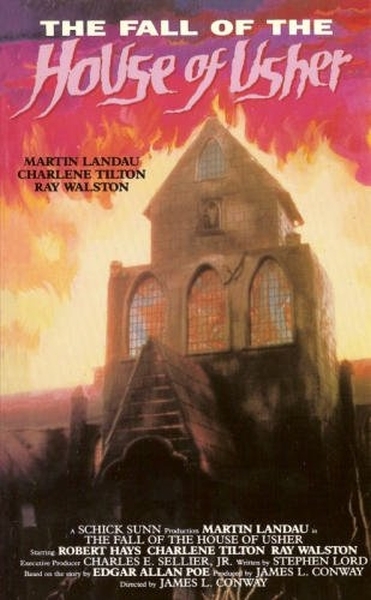 Other adaptations of the Edgar Allan Poe story are:– Jean Epstein’s French silent version The Fall of the House of Usher (1928); a dreary British version The Fall of the House of Usher (1949); Jesus Franco’s cheap The Fall of the House of Usher (1983) with Howard Vernon; Harry Alan Towers’ equally cheap The House of Usher (1989) with Oliver Reed; the low-budget modernised The House of Usher (2006); David DeCoteau’s softcore gay House of Usher (2008); and as an episode of the animated anthology Extraordinary Tales (2015).